I am all for eating things that are in season. I look forward to particular times of the year so I can eat certain foods, knowing they’ve been produced in the UK and taste as good as they possibly can. In season at the moment is kale, and in season it will stay until around the end of January – leave it too long and it will begin to taste too bitter. Kale was one of those things that I disliked as a child, along with sprouts, spinach and olives. Now I am pleased to say that my tastes have matured and I greatly enjoy the flavour of kale and many of the other vegetables that come under the brassica oleracea umbrella. 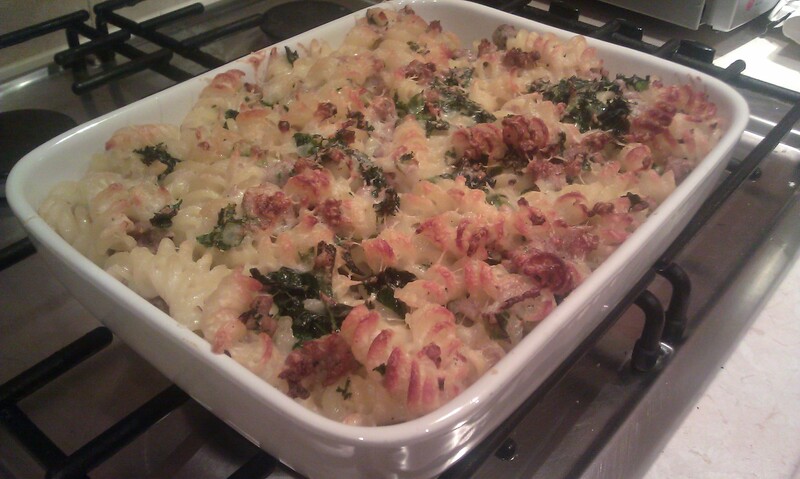 Kale seems to work very well with flavoursome pork (and spectacularly well with chorizo) – I tried this particular recipe for the first time last week and it’s a very tasty winter warmer. Preheat the oven to 200C/180C Fan/Gas Mark 5. Bring a pan of water to the boil, add salt then add the fusilli, and cook according to packet instructions. Bring a second pan of water to the boil, then add the kale and cook for about a minute, or until it turns bright green. Drain it, run under cold water, then squeeze out the excess water. Heat the oil in a frying pan, add the onion and cook over a medium heat until soft. Add the sausages and fry them until brown, breaking them up with your spoon as you go, then mix in the kale and nutmeg, and season. 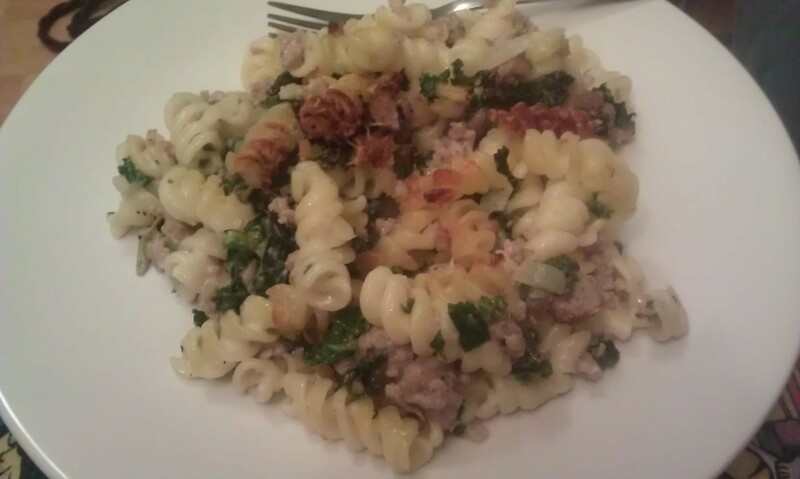 Once your pasta is al dente, drain it, then stir in the cheese sauce, and the sausage and kale mix. Transfer to a medium-sized oven dish and sprinkle with the parmesan. Bake for 30 minutes, until the top is crisp and lightly browned.